The Holmes® Towing Service Vehicle (T.S.V.) features an aluminum modular designed body to haul up to 36 batteries, an electric air compressor and most of the necessary equipment and tools you need for road service calls. If the auto needs a tow, the Holmes® T.S.V. is equipped with a Holmes® 220 Snatcher wheel-lift system to bring the disabled auto home. 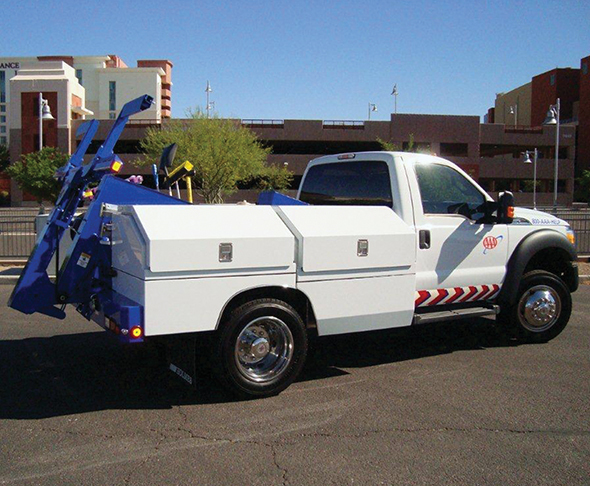 The unit is also available without the wrecker as a service body to be mounted on a lighter GVW truck. Call 800-292-0330 or visit MillerInd.com.